It was hard for me to come up with a title for the painting so when I meditated on it I came up with "Universal Truth". You see, I hold you in highest esteem as an energy worker and I see you filled with light and all kinds of wonderful colors and energy. 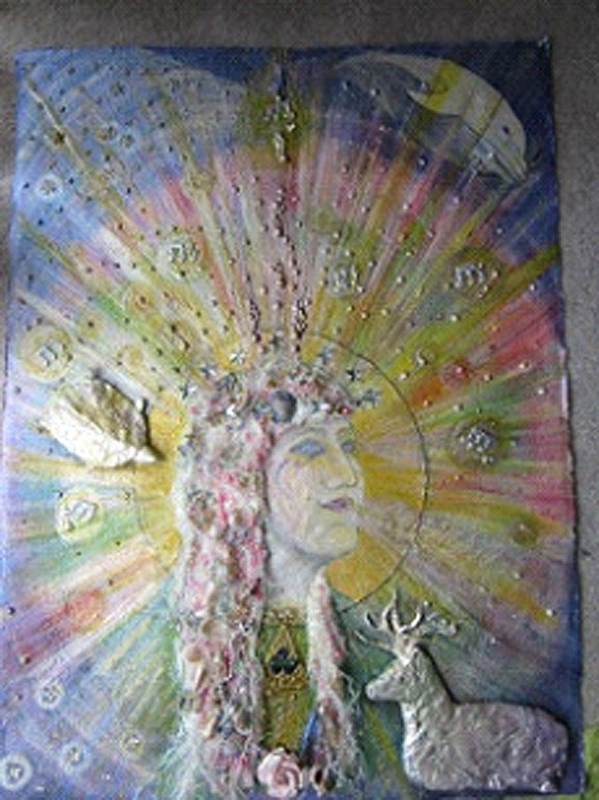 I believe everything you do is with the highest and best good for the planet, the people and all life so that is why the painting just goes on and on in layers and layers of paint and glitter and orbs and circles. I see you as representing the new "Truth" for the new earth so that is why I named it "Universal Truth". Also because you do travel the world in your quest to heal I felt the dolphin represented that aspect. The turtle of course, is the USA and the stag represents the forest/earth mother. The gold paint represents "unity/oneness" of the planet. The rose represents the "divine feminine". I think that about covers everything but if you have other questions please feel free to ask. Oh, of course the long white hair is "wisdom" which you certainly have. Jette, if I could be like anyone when I have reached my "highest self" it would be you. You are so beautiful and soft and just radiate so much love to all.